Shoemaker Levy 9: 20 years later. KABLAM!! Infrared photo of Jupiter shortly after impact of one of the cometary fragments. 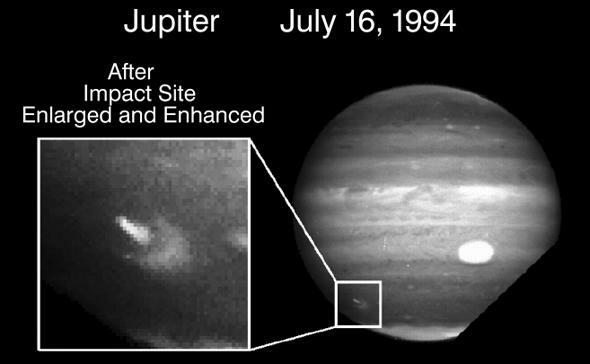 Twenty years ago on this day—July 16, 1994—Jupiter got slammed, hard, by a comet. It was the first time we had ever witnessed such a collision on a planetary body other than the Earth. I’ll note I’m very glad it wasn’t Earth; we wouldn’t be here talking about it if the comet had had us in its crosshairs instead of Jupiter. The comet was discovered on March 24, 1993, by the team of Eugene and Carolyn Shoemaker and David Levy, who were taking pictures of the sky to look for comets. Right away they knew they had something odd—although comets are generally fuzzy and elongated, that’s usually due to their long, sweeping tails. This one appeared to have a long, fuzzy head. The head is the central part of the comet, the solid nucleus (generally made of ice and rock) surrounded by gas. 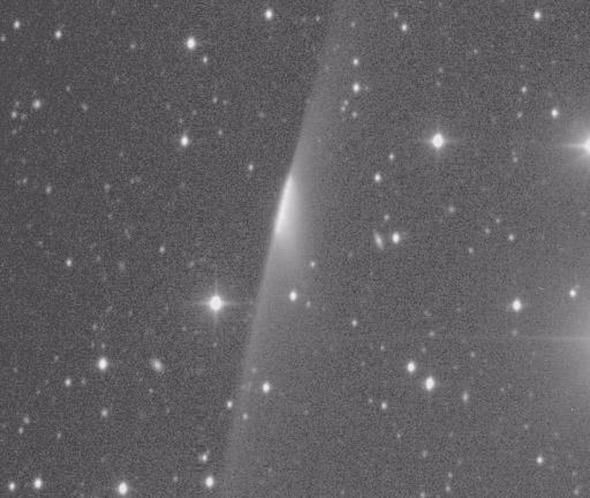 Heads are usually pretty compact, but this comet had one that was stretched way out, like a thick line (I have a fun post describing all the parts of a comet and how they work). The comet as it was seen a few days after discovery. Note the elongated head, and the tail which fans out above and below. Being the ninth comet the team had found, it was dubbed Shoemaker-Levy 9, or, more technically, D/1993 F2. Those in the know just called it SL9. It was noticed that the comet was near Jupiter in the sky. The team backtracked the orbit in time, and found it had recently passed very close to Jupiter … and in fact, it was in orbit around the planet! At this point, a more complete picture emerged. The comet had orbited the Sun for billions of years. But in the 1960s or 1970s it made a close pass at Jupiter, and the giant planet captured it. This is a relatively rare scenario and takes a fairly specific set of circumstances to occur. However given enough time and billions of comets, it’s inevitable. The comet orbited Jupiter on a highly elongated path. On July 7, 1992, it passed so close to Jupiter that the planet’s mighty tides tore the comet apart. The pieces separated along a line, and when it was discovered a year or so later these distributed pieces are what gave the comet its squashed look. And then astronomers got the big surprise: Calculating the orbit of the comet into the future, they saw it would physically collide with the planet in July of 1994! The “string of pearls”: The fragments of SL9 all in a row. Each piece? Doomed. I was in graduate school at the time, and boy, howdy, do I remember the excitement. 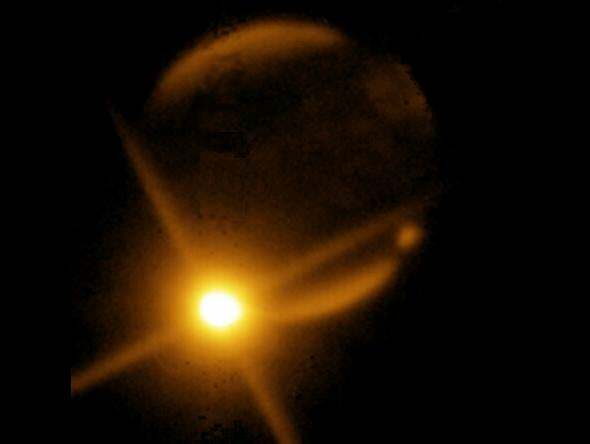 No comet or asteroid had ever been seen hitting a planet besides Earth before. And SL9 was made up of dozens of individual pieces, each on a doomsday path to Jupiter! This was going to be big. Unfortunately, the pieces were due to hit on the far side of Jupiter, which means we wouldn’t directly see the impacts. But it turns out we still got quite a show. When the day came, practically every telescope on and above the Earth was watching. The first piece impacted at 20:13 UTC (2:13 p.m. 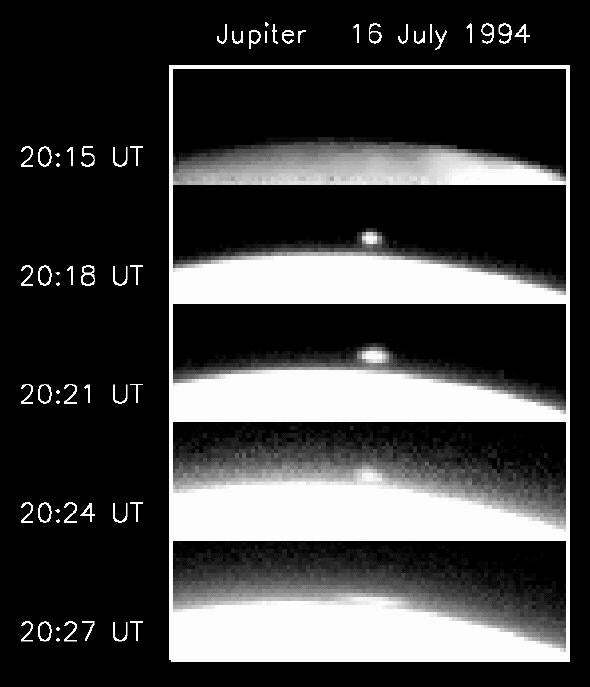 ET) on July 16 … and within minutes pictures started pouring in from telescopes. Although the impact was on the other side of Jupiter, the huge plume from the impact rose so high it could be seen over the limb of the planet. Within a few minutes the impact site rotated into view, and we were all stunned to see photos showing a vast scar from the collision. The first piece (Fragment A) was about 2 kilometers in diameter and moving at 60 kilometers per second when it hit Jupiter—the energy equivalent of over a million one-megaton nuclear bombs exploding at the same time. The bright spot to the upper right is Jupiter’s moon Io, and you can see the Red Spot, too. Then the impact blossoms as Jupiter’s rotation swung it into view. Yikes. Within minutes, Hubble Space Telescope images were sent down, revealing the impact site: a vast splotch with a crescent-shaped fan of material blown ahead in the direction of the comet’s motion. Fragment A’s collision left a scar on the top of Jupiter’s clouds larger than Earth itself. It was stunning. Fragment A impact site (using a filter that accentuates methane in Jupiter’s upper atmosphere). Over the course of the next week the remaining pieces hit, one after another. Fragment G was the biggest, but several were over a kilometer across. Jupiter’s powerful gravity accelerated them to their doom, and each gave up their individual ghost with a titanic explosion. In the end, this was one of the most studied events in the history of astronomy. And it was full of surprises. We expected to see a lot of water released by the impacts, since it was thought there was a layer of water vapor in Jupiter’s atmosphere. Some was seen, but not nearly as much as predicted. The impacts generated tremendous waves in the atmosphere of Jupiter that were seen traveling away from the collision for hours. The chemical composition of the atmosphere was temporarily altered as well. The plume from the explosion of Fragment A as it rose and collapsed over the limb of Jupiter. A few things remain stuck in my memory from those days. One was how dang slow the Internet was; we’d wait forever to download a 100kb image of the impact from the SL9 sites where they were being uploaded. It didn’t help that a million other people were trying at the same time. Back then, the ‘Net was pretty new, and most servers couldn’t handle so many people trying to access them. The other vivid memory was from a few days later. I was at the University of Virginia, and we had a huge 24-inch telescope there, built in 1885. I went out to observe Jupiter, but the air was unsteady that night, and all I saw was a blur. So I went around the observatory to “The Doghouse,” a smaller brick enclosure that housed a vintage 6-inch brass ‘scope. Pointing it at Jupiter, I was stunned to my core to clearly see several black scars punctuating the planet’s cloud tops. The bigger telescope accentuated the blurry air, but the smaller one didn’t have as much magnification, and the unsteady atmosphere of Earth didn’t affect the viewing as much. I remember standing there, slack-jawed, knowing I was witnessing history. Since those days two decades ago we’ve seen Jupiter hit several times; in July 2009, in June and again in August 2010, and a fourth time in September 2012. We’ve seen Saturn’s rings get hit by debris (actually multiple times), the Moon hit by small asteroids, asteroids themselves collide, and we just missed seeing an asteroid impact on Mars … but a comet will pass so close to Mars later this year that it could rain debris down on the planet. We’ll see. And, of course, our very own Earth got whacked by the Chelyabinsk asteroid. The lessons of SL9 are many. Impacts still happen across the whole solar system, even after 4.56 billion years. We need to keep watching the planets and look for such rare events. And, of course, the Earth is no exception as a target. This stuff is real. And the public, when it comes right down to it, loves it as well. On this anniversary of one of the biggest bangs in the solar system, I think we all need to be reminded of that.